In January 2006, Bernd Heine (University of Cologne) and Rainer Vossen (Goethe University of Frankfurt/Main) organised the Second International Symposium on Khoisan Languages and Linugistics in Riezlern/Kleinwalsertal, Austria. About thirty international researchers attended the meeting which was dedicated to the late Pastor Eliphas Eiseb (1918–2005), co-author of the renowned Khoekhoegowab Dictionary (published in 2002). 27 papers were presented on various aspects of Khoisan linguistics. 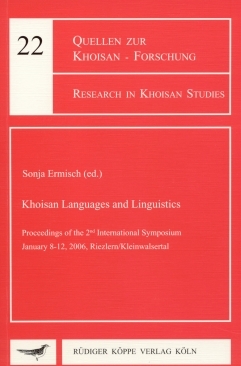 However, the proceedings which are now being published as a result of the symposium do not include all the contributions, but a selection of papers which touch upon problems of Khoisan phonology (Exter), tonology (Elderkin, Haacke, Honken, Naumann), morpho-syntax (Chebanne, Eaton, Kiessling, König), sociolinguistics (Monaka & Lepekoane) and ethnolinguistics (Takada) as well as cognitive linguistics (Brenzinger). Person, gender and number markings in Eastern Kalahari Khoe – Existence or traces? The presentation of the articles published in the volume under discussion testifies to an enormous progress in the study of the Khoisan languages and cultures, and points to some lacunae which should be fulfilled in the forthcoming studies. The collection makes a wealth of data available due to the wonderfully detailed descriptions of many of the authors. Also the papers highlight some of the areas in which a lot of work still needs to be done in the field of Khoisan languages.